We had our monthly Audubon field trip this morning, the subject being how to take bird pictures. For the participating 17 birders, the morning started with high winds and overcast skies but no rain. In our talk about bird photography, we explained how difficult it was to take a picture into a very light background. 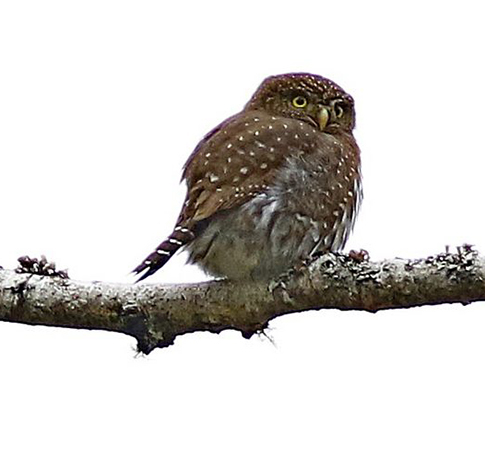 Turns out we needed all our expertise in taking pictures of a Northern Pygmy Owl. Field guide, Mark Elliot, mentioned when we first started our trip to look out for this owl. We don't know why he said that since we very, very rarely see them. Just before our walk got over and only 50 yards from where we started, one of our group spotted this owl on a branch next to the road. He happened to be the only person from out of state, Kansas of all places, where they do not have this bird. What a treat for all of us! 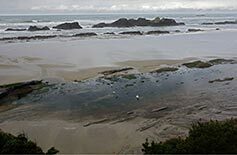 It was the calm after the rains that drew 20 birders to Boiler Bay. The morning was gray but with no wind or precipitation. Meeting in the parking lot at Boiler Bay State Scenic Viewpoint 20 birders, from as far away as Indianapolis IN and Yachats OR, gathered in a circle to introduce themselves to each other before scoping out the area for sea and shore birds . 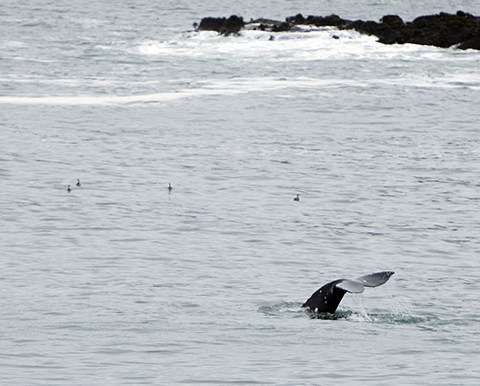 . . but not before immediately spotting Gray Whales just north of the parking area. So it took a while to get everyone together and to direct their attention to birding! 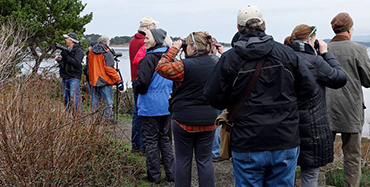 During stops from Boiler Bay to Devil’s Punchbowl State Natural Area, field guide Mark Elliott continuously set up his scope so others could get close views of Black Oystercatchers, Pacific Loons, Harlequin Ducks, and more. 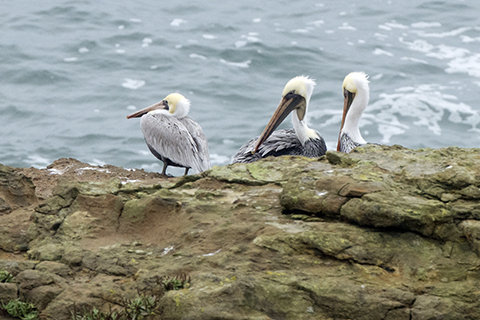 Brown Pelicans and Surf Scoters were migrating south in large and numerous groups. In all, it was a very pleasant morning and an enjoyable birding experience. What a beautiful, sunny morning to spend in kayaks searching for the winged ones! 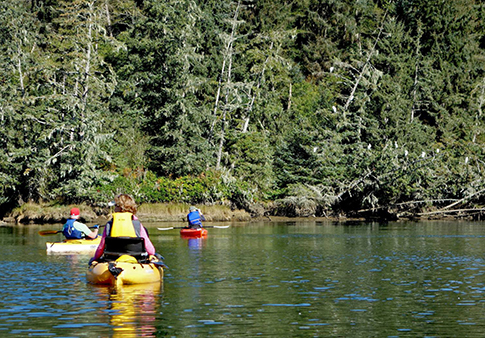 Six birders, from Lincoln City, Otis and Depoe Bay enjoyed paddling and birding the Little Nestucca River. 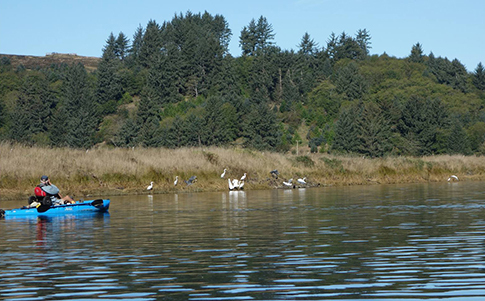 Even before we launched our kayaks in the river, a Bald Eagle made an appearance just on the other side of the river. We caught the river during slack tide and headed down river toward the bay. Up ahead, 150-200 yards, about a dozen Great Egrets and just as many Great Blue Herons were mingling along the river bank. And just in front of them on a sandbar must have been about 75 Double-crested Cormorants. In all 26 bird species were sighted. On the return trip, a Belted Kingfisher led us upriver for quite a distance. Oh, and let's not forget that we saw 2 other Bald Eagles perched on a tree at river's edge. Fantastic morning!! Had a very nice bird outing this morning guided by Jack Hurt. To our surprise we shared Bayocean with a 5K and 10K foot race. 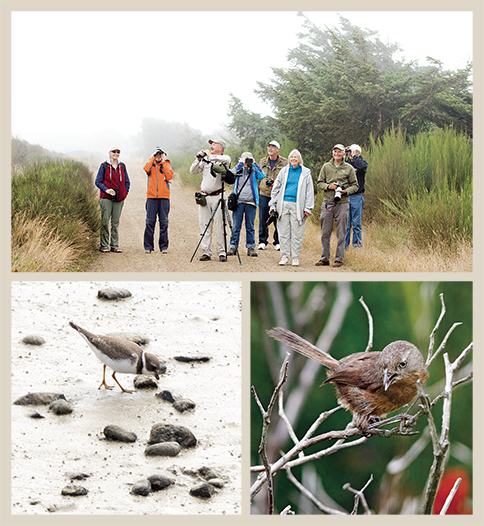 In spite of such a foggy morning, birders did manage to see and photograph a number of birds. The highlighted bird of the morning was the Wrentit. Jack Doyle managed to get a great shot of the elusive bird. Another great find were Caspian Terns. The Peregrine Falcons were quite active when the eighteen birders arrived at the visitor center parking lot. One was chasing a Turkey Vulture and two others were playing war games as they easily maneuvered with death-defying, high-speed dives. Down below, birders had their cameras aimed in the sky to record what was happening above. Back on the walk, after his recent knee replacement surgery, field guide Mark Elliott gathered everyone together and proceeded to walk in the direction of the lighthouse. On the way, we witnessed a mother Barn Swallow feeding its chicks in the nest. Whewww, the wind was howling as we tried to steady our cameras and spotting scopes, yet it was a beautiful sunny morning. 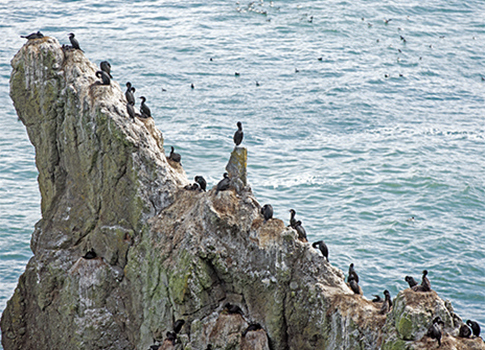 The murres, cormorants and gulls were either gathering new nesting material or tending to their young as the vultures were scoping them out from above. The falcons were the only raptors we saw this morning. Once again, we had a very enjoyable and rewarding experience. It was a warm morning with the sun breaking through the clouds. There were 17 of us walking along the road listening to the songs of the birds. Tamara Quays was our first stop and while we could tell the song of the Swainson's Thrush it was never in our sight until.....it decided to rest on a branch. It was too wet for cameras. 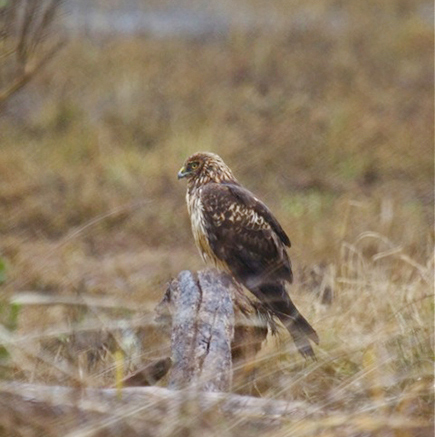 We had about 10-12 birders and considering the weather saw some interesting birds. on the beach and you could tell by the birds that were present it was "migratory bird day" for Mew Gull, Bonaparte’s Gull, Dunlin, etc. There were 9 people present for the bird walk. We saw or heard 16 birds we could identify and heard a lot of birds we couldn’t identify or find to see. Birding was mostly by ear at this site. Unfortunately, the marsh trail was not available – closed this time of year, and the south access point parking can’t handle more than 6-8 cars. The road we walked did provide some marsh overlook but no view of open water so no view of waterfowl. When we left Otis it was 39 degrees, dark, cold and raining with a forecast of 100% rain all day. 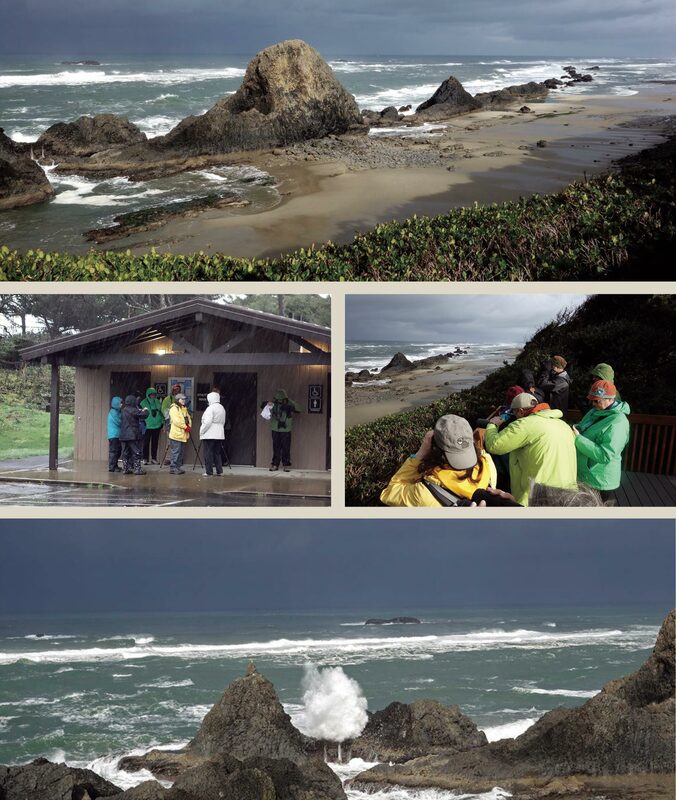 Rained all the way down to Seal Rock but at 9am the sun came out for us to start birding, the surrounding sky was black. After 30 minutes the sun went behind a few clouds as we moved to a location looking south down the coast. It was then we saw lightning followed by thunder and more rain. We went back to the parking lot to wait out the downpour before heading down 101 in search of more birds. At the second spot all the birds that were on the beach suddenly took off indicating the fly over by a Bald Eagle. The highlight of the trip was a lone Peregrine Falcon sitting atop a high rock formation 100 yards out. "Red sky morning, sailors take warning." That's the way the morning started but 26 birders lucked out. Although it was a bit chilly morning, there was no rain, yet! With field guide, Mark Elliott, the morning started at the dock next to Mo's restaurant. Unfortunately the dock was closed off but we did manage to see quite a few birds such as Great Egret, Common Loon, Bald Eagle, grebes and mergansers, gulls, and other species. 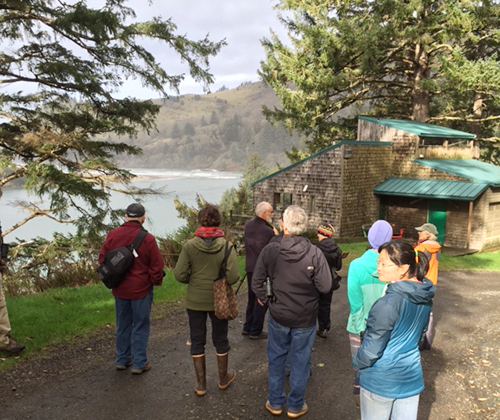 From 51st Street we headed to the Salishan Marketplace to walk the Salishan Nature Trail along the north side of the golf course. 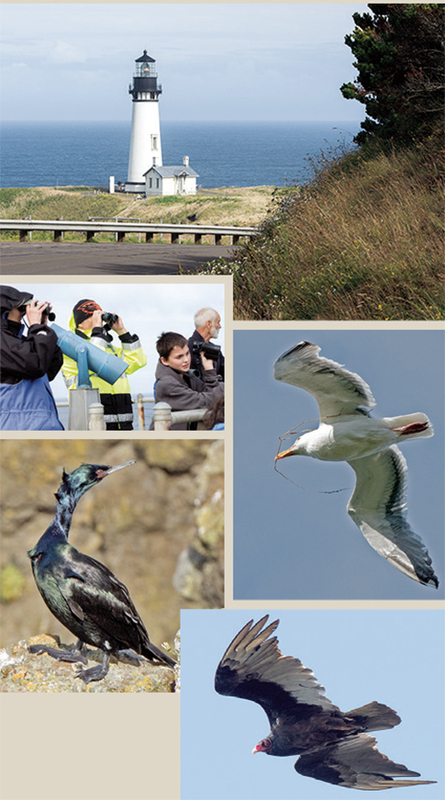 This is a short yet interesting trail with a variety of bird species. A great morning for all. 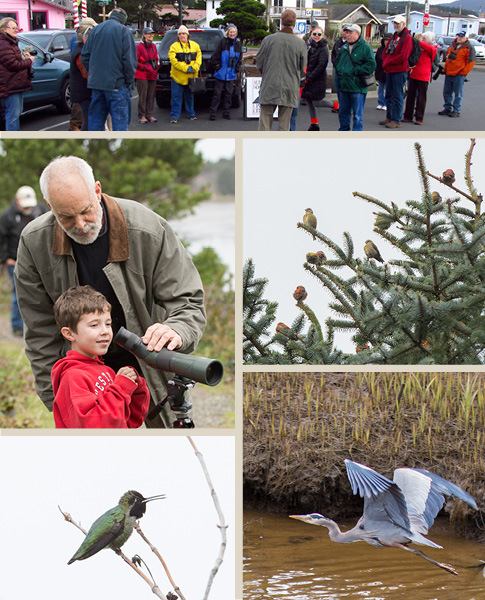 Another great Audubon outing for 18 birders, this time at Newport. Rainy and cold to begin with and then the bright sun and warmth broke through the clouds as predicted by Mark Elliott, our Field Guide and weather prognosticator. 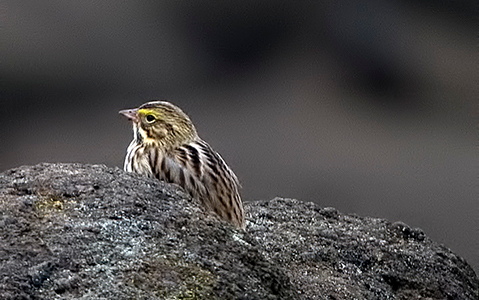 Mark located several outstanding and rarely seen birds by us. 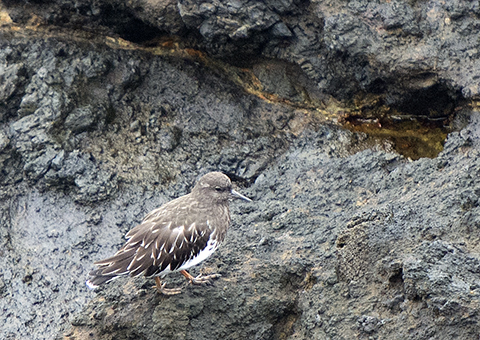 They included Bullock's Oriole, Snowy Plover, Mountain Plover, Harlequin Duck, Brants, and a flotilla of more common species. Thank you Mark Elliot for leading the charge.